If you look very, very carefully at this majestic photo of Saturn, you can see a number of familiar astronomical bodies and features, including several Saturnian moons, Mars, Venus, and even Earth. You'll find a fully annotated version of the photo below. 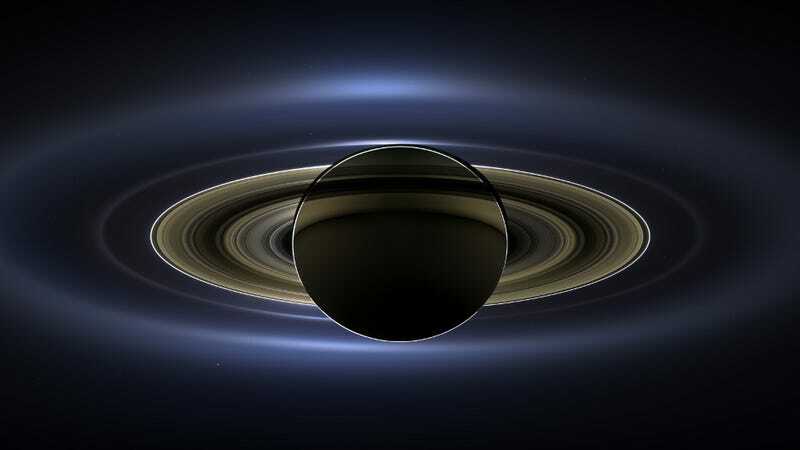 The photo was taken by the Cassini spacecraft last July as part of The Day the Earth Smiled Project. If you still can't make them out, the objects listed are (from left to right): Enceladus, Prometheus, Epimetheus, Ring spokes, Mars (way up at top), Tethys (way down at bottom), Ring clumps, Venus, Janus' ring, Janus, Pallenene's ring, Earth-Moon (at bottom right), Mimas, and Pandora. ...This image spans about 404,880 miles (651,591 kilometers) across. For hi-res versions of this image in far greater detail, go here.